This little shop is so adorable! 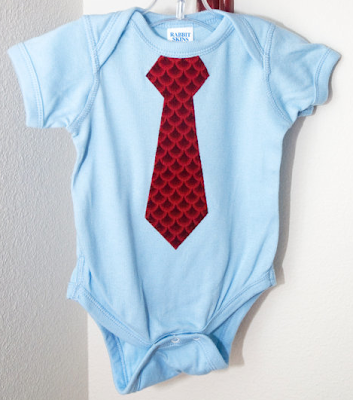 Barbie just recently started this creative outlet via Etsy, which features personalized ties that can include an initial or even a number for that special birthday boy or girl! 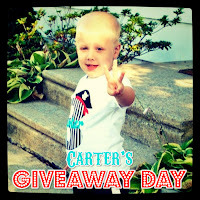 To enter, simply visit Sweetpea a la mode and leave a comment telling us what you'd use your cutom tee for if you won! That's it =) Oh, and don't forget to leave your email address so we can contact you! Giveaway ends on July 19th at 11pm EST. How about a vote for the birthday boy!?! I would use my custom tee for my sweet little man, Colton, who just turned one. He would be absolutely adorable in one of those little ties!! I would use it for my son's Birthday party outfit! My son, Hudson, would love so adorable in the "Caleb". My husband loves plaid ties so I know he would love his son to have the same fashion sense. :) Thanks! I would definitely get my lil man one for his soon to be 3rd birthday! Oh I'd get the Nathan for E!! Love the colors. Oh i have a 10 month old and 3 day old nephew who i would pick something out for! 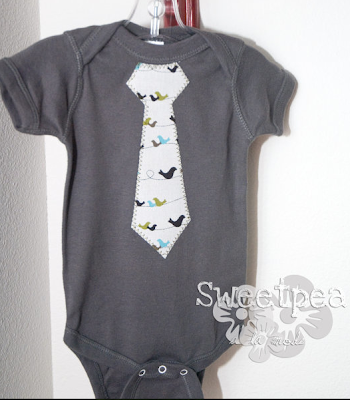 I love the tie T's and onsies! So adorable! He would really like the 'mark' one. My son Briggs would wear it and I love the Caleb. He's 4 months old and would look so cute in a little tie! My son Hunter could wear it to our family reunion in PA. I love the Korben, but I would use it for my son's 3rd birthday! I loved your son's t, Jenni! LOVE the Nathan! It is so cute! I would get it for the little man on the way! Oh goodness, I LOVE those onesies! I've never had one with a fake tie so I would get one of those! YES! I just die for a little man in a tie! We'd use it for his exciting trip to meet his Great Grandparents! I would use a custom tee for the baby boy we're expecting in November! The Nathan is my favorite design - these are SO cute! Love these!What a great idea! My son Dylan could wear this at his 2nd birthday party in September! My son would look adorable in the 'Nathan'! Great giveaway! I would use "the Caleb" for our family picture we are getting taken this fall! I would get a tee and then another one for my two boys for our family pictures coming up :) Too cute!! So cute! I would use it for when my little guy turns one. And I am loving the olive green color onesie. They are all so cute! I would love to use the "korben" for our family pictures coming up in September. So cute!! I think I'd like to win the Nathan!! So adorable. Since I love my lil' Peanut in blue and I love stripes I'd have to go with a Korbin t-shirt :) So cute! oooh...it's a toughie! i think probably black with some awesome red pattern! I am obsessed with these but Jude could always use a new one. I think we would go BRIGHT this time. Maybe yellow with some fun patterns! One of these tie shirts would be adorable for our family pictures! I would order the Korben or the Emery--adorable! And it would be a tough choice who to give it to. I know a few adorable baby boys who would look quite stylish in sporting those onesies!! I love the The Korben tee. Oh my goodness!!!!! 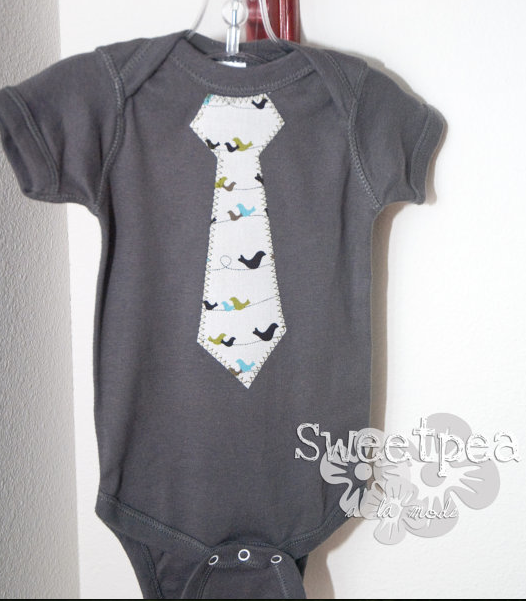 The onesies with the ties are ADORABLE!!!! I would use them for both of my new baby nephews that were born within three days of one another!!!!! SOOOOOO CUTE!!!! I'd love to get The Emery for my son! So cute! I would get my little boy a tee wit the number 4 for his upcoming birthday! I would get a cutom tee with a tie on it for my little guy! I would love one of these for my son Gabriel. He is 14 months but an initial one would be great! I would use it in addition to the one that she is already making for my little girl. Something cute and girly for her to wear! I would use the tee for one of my sweet boys. I am not sure which. I would use it for my daughter's third birthday - or maybe just an initial t-shirt, those are also super cute!! I would love to use it for my lil mans six month pictures! I would def order one for our Godson's baptism as a gift! Adorable!! I would either have a custom T made for a future son. Or have a custom letter or number T made for my darling little cutie of a daughter Aubrey. I would use my custom tee for The Korben. It's so cute. I would get my nephew a cute little tie onesie, just because! I would get the Holden for my newest little guy, we are doing a 6 month photo shoot in Ocotober and the colors would be great! I've been wanting to get one of those shirts for my son forever :) I would get probably dark gray with a striped tie. So cute!! Oh, love them all! It would be a hard choice for my 1 yr old! Love them all but the Holden stands out. I'd either save for future baby or give to a friend having a boy soon.